You will now find yourself in the so-called traffic, unless you are riding on the island of Saltholm, but we’ll assume you’re on a busy street. As soon as you’ve run over the first person you come across you immediately accelerate and try to dash across the intersection while the yellow light is lit. If the light turns red in the process, pretend like nothing happend and continue on – there is nothing easier than pretending like nothing happened. Those who are approaching from the side – whether in a car or on foot – will no doubt let you pass. They will think that it is them who has made a mistake. So ingrained is the bad conscience in all of us. Now you continue riding. Let’s say you have to turn to the left. Extend your hand – please be careful it can’t be seen – to the right. This means that you won’t be turning that way. 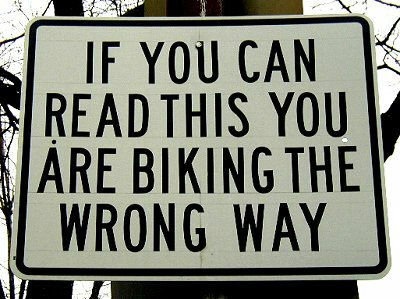 There has been some discussion about this question but as a cyclist you must never doubt. Your entire focus must be on your riding. The use of a bicycle bell is absolutely out-of-date and simply unecessary. The bell can’t be heard above the noise and you should therefore only use your bell after midnight – or after you’ve arrived home. If you’re going from the street into a port leading to a courtyard or similar, always weave through the pedestrians as dramatically as possible. The bell must NOT be used here – remember that! If you use your bell you’ll make people jumpy and it will be much more difficult to weave past them. In the courtyard you discard the bicycle as carelessly as possible, in order to give any potential bystanders the impression that you’re cool (superior in intelligence). Ensure that the bicycle is placed so that anyone and everyone can trip over it. You’ll quickly discover that the person who trips over it will pick it up and place it politely against the wall – usually under a sign that reads: ”Bicycles will be removed”. This is generally because the police aren’t bothered much if you cycle without lights, as the statistics show. In 1932-1933, on the stretch between Here and There, only one bicycle light was observed. According to the police report it wasn’t possible to identify the cyclist – he was riding like a madman. Yes, well, those were my modest proposals for a new traffic etiquette for cyclists. We have, for far too long, been viewed in a negative manner by Mr Motorist and pedestrians – or rather sleepestrians – and I feel that these proposals will please every motorist and sleepestrian – we apparently haven’t evolved any further than this in our sorry old world.